So much yarn, so little time. : GIVEAWAY! One of my favourite sections in 'Wind in the Willows' is when Mole suddenly senses he's near home and gets all excited - so to enter my giveaway I'm going to ask you to leave me a comment telling me something that says "I'm home!" to you. On Friday I'll put the entrants into random.org and choose the winner - that's it! Easy peasy! 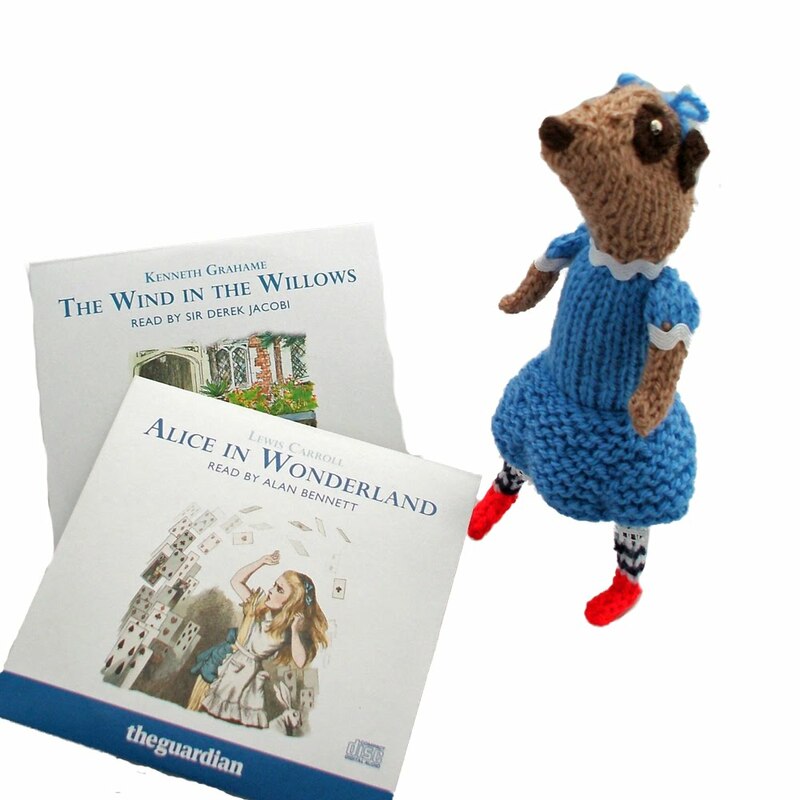 I'll also send you one of my fridge magnets which go out with each of my knits. 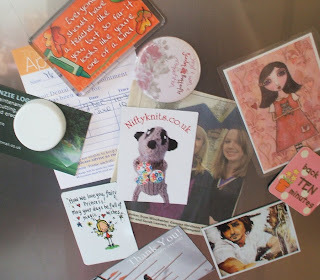 I read recently on Etsy forum that some people chuck magnetic business cards like mine straight in the bin, so for a second entry please leave me an honest answer (don't worry about hurting my feelings) - do you throw fridge magnets away, or would mine end up on a fridge somewhere? And I have a gazillion things stuck on my fridge and even have a 'save the date' magnet from my friend's wedding years ago so yours would not be in the bin but on the big white door (no guarantees you'd be able to see it though)! There is a place on the freeway where when I am driving into my hometown where the county line changes and the trees and scenery all change at the same moment, I always feel so excited and thrilled to feel and see the ultra familiar. I love fridge magnets, what else do you look at when you are deciding what to eat? Nice giveaway. What says home is the dogs wagging tail as we drive into the yard. Magnets - can go either way here. some I keep, some I toss. Home is when I drive up our street and see my streetside garden - the hot pink of the Stargazer lilies trying to out shout the orange double daylilies in July. I have a few magnets on our fridge at the moment. I'd keep yours 'cause I'd have a sentimental attachment :) Besides, how many people can boast of meerkats on their fridges?! the thing that says i'm home, 2 small people rushing at me yelling 'mummy' and grabbing my legs! i keep fridge magnets, so many bigs of half information to keep, so little room on the fridge. magnets will only hold up so much! hello nifty, whenever I drive towards home I pass a pub called the wiltshire yeoman, which tells me I'm nearly there. oddly enough when I lived in surrey I used to pass the surrey yeoman and think "nearly home" too. RHD isn't far at all, but the steam railway in our town (Tenterden) is the East Kent I think. Home is Friday evening... sitting in the kitchen on a rainy day,a thick soup is on the stove ,in the oven a cheese cake is being baked,the candle lights are shining and all my family sitting around the dinner table, having the traditional weekly family gathering, telling stories and dinning to their hearts content. Their laughter and joy fill the room with happiness and love and I think to myself how true is the saying "Home is were your heart is ..."
Home is full of colour and wonderful bits and pieces collected from all over. I've lived in so many places that home tends to be where my familiar bits and bobs are. My fridge is covered in magnets collected over the years too and no way would I throw yours away! Home is where the people I love are wherever that is at the time. I have a fridge covered in magnets with all those little notes to remind me to do things attached. My fav says 'stressed but fabulous'. Home as in home-home, 'oop north is the drive from Ripon to Harrogate in Spring. The road is nice and bendy, the scenery is beautiful and the fields are full of lambs. And then at the first sighting of Ripley, my mother will ask me if I want an ice-cream, irrespective of the outside temperature. Then I know I'm back 'ome! Home down here is my cat rubbing against my legs as I fumble for my keys in my bag on the doorstep. And I always keep magnets! I know I'm approaching home when I start smelling Kentucky Fried Chicken. They are a block away from home, but the "aroma" can extend quite a bit further on some days. YOur magnet would find a home on my desk, not fridge. It's way too cute to throw out. LOL nothing says home quite like KFC...how the advertisers would love yours, kitten! I always save refrigerator magnets. My fridge is actually covered with pictures and all sorts of fun stuff, so I need magnets to hold it all up.